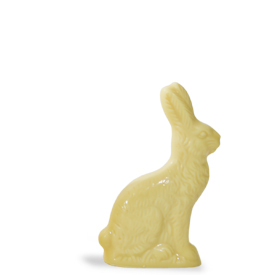 Our smallest Easter Bunny is four ounces of solid Swiss white chocolate. This bunny stands just under five inches tall and arrives Easter Basket ready in a clear gift box with a silver bow. Perfectly sized for Easter Baskets, little Easter gifts, and fun table settings!